Natural gas grills continue to increase in demand as the provider market place continues to expand. For gas grilling enthusiasts looking who prize efficiency and size, combined with visual appeal, Napoleon offers their T495SBNK Triumph. The grill is set up to use natural gas and comes with a connector hose. Just make sure to double check your own municipal natural gas connection. While there is a propane version of the grill available, you should never use propane while it is set up for natural gas. 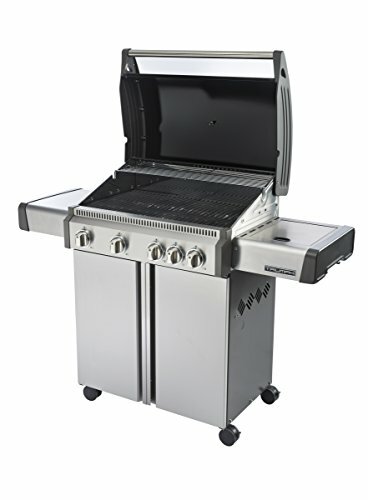 The Napoleon T495SBNK Triumph offers 495 square inches of primary grilling space, which is enough to grill up to 30 hamburger patties. The grill grates are made from thick cast iron, that has been porcelainized for maximum heat retention as well as non-stick properties. It’s also worth noting that the Napoleon T495SBNK Triumph is capable of supporting an accessory rotisserie, which they don’t necessarily do with all their grills. Napoleon’s website sells it as part number 69411. Each of the four stainless steel natural gas burners comes with a friction igniter, so you don’t have to worry about the hassle of installing a single AA battery that will eventually run out of charge. It also has a convenient bottle opener built into the stainless steel cart base. When all four burners are turned up to the max the Napoleon T495SBNK Triumph is capable of producing a very efficient 57,200 BTU’s of heat. The side table folds up to help you conveniently store the grill. The right side table also has an integrated stainless steel burner, which allows you to make your side dishes or sautéing vegetables without having to constantly run back and forth to the kitchen. The side tables also have tool hooks integrated into them. Unfortunately, they don’t do you any good when the side tables are folded down, which means you will have to keep them stored in the cart. The Napoleon T495SBNK Triumph is largely made from high-quality stainless steel, which also adds to its visual appeal. All the burners are also made from stainless steel, and the friction-based ignitor spares you the inconvenience that sometimes comes with when an AA battery goes dead on an electric start. The thick cast iron grill grates help with heat retention and they are also porcelainized to be nonstick. 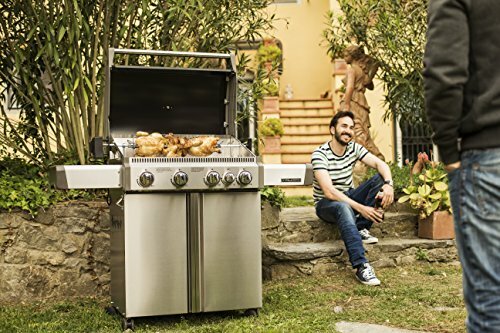 While it’s nice that the grill is designed to accommodate an accessory rotisserie, the warming rack can sometimes get in the way and needs to be removed before you install the rotisseries, so keep that in mind when you preheat the grill. The warming rack is also a little flimsy and it doesn’t have much of a lip to prevent things from rolling off of it forward. 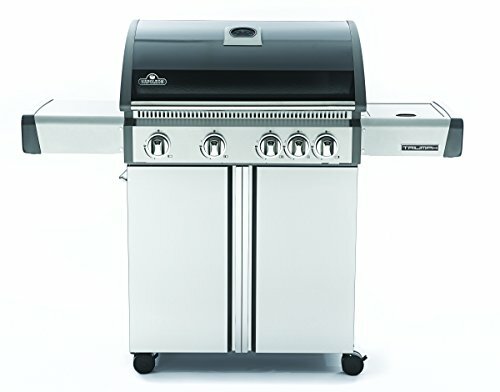 Gas grills typically take longer to assemble. This is true with the Napoleon T495SBNK Triumph. However, with some basic mechanical skill and regular household tools, you should be able to fully assemble it in around two hours. If you aren’t very handy, or you’re short on time, there are online retailers who offer an expert assembly service for a relatively friendly price! One thing to note is that the hose for the side burner can sometimes pinch when the side tables are folded up and down. When you are assembling it, give a couple of test folds to make sure there’s just the right amount of slack to keep from eventually wearing on the hose. Natural gas grills are known for their efficiency. 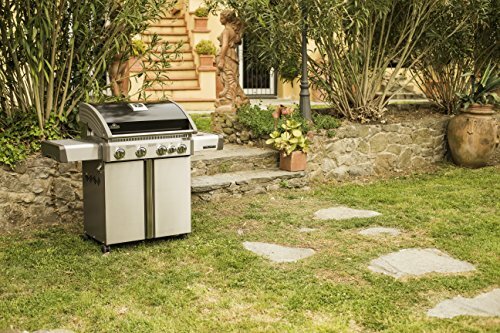 However, since natural gas has roughly a third of the energy density of propane, it gives some natural gas grills a reputation for not being all that hot. The Napoleon T495SBNK Triumph doesn’t have this problem as it produces a very efficient, yet hot 57.200 BTU’s of heat. Just make sure that you let the grill preheat for 10 to 15 minutes, to allow the cast iron grill grates to soak up the maximum amount of heat energy. 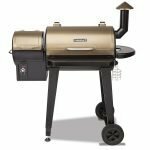 The 495 square inch primary grill grate is large enough to grill for a large family or even a decent size family reunion. If you want, you can also create two different heat zone for indirect heating and hybrid grilling. Napoleon also set up this grill to be able to accommodate a rotisserie, which really lets the T495SBNK Triumph shine. Just keep in mind that the rotisserie does create a lot of drippings, so try to set up an aluminum foil drip pan under it, to spare you what would otherwise be a lot of messy cleanups! 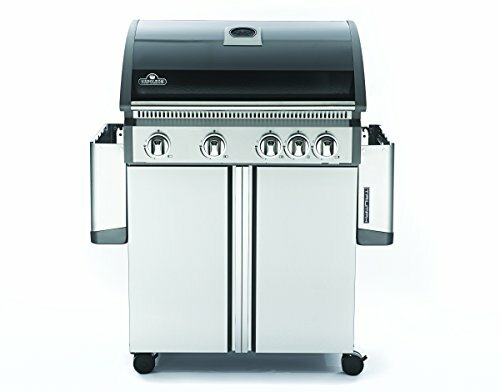 The primary grill grate provides 495 square inches. The warming rack is 170 square inches for a combined 665 square inches of grill space. 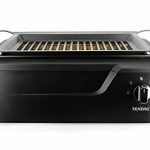 The stainless steel side burner allows you to prepare a side dish without having to leave the grill. The friction igniter and the integrated bottle opener are also convenient, but not entirely necessary. The porcelainized grill grates are relatively nonstick. You can usually clean them off with a wire or stiff nylon bristle grill brush. They’re also removable if you need to soak away something that’s stubbornly stuck on. The stainless steel natural gas burners can be a little tricky to clean if excess marinade drips on them. If possible, let the grill cool all the way down, use a lightly damp non-abrasive sponge to wipe away any loose material. You can then gently scrape away any stuck on material with a stiff bristled nylon brush. I wouldn’t recommend a wire brush as it could start to scrape up and possibly damage the burners. The Napoleon Triumph comes with a multi-tier 10-year limited warranty on the aluminum castings / stainless steel base and the stainless steel lid. 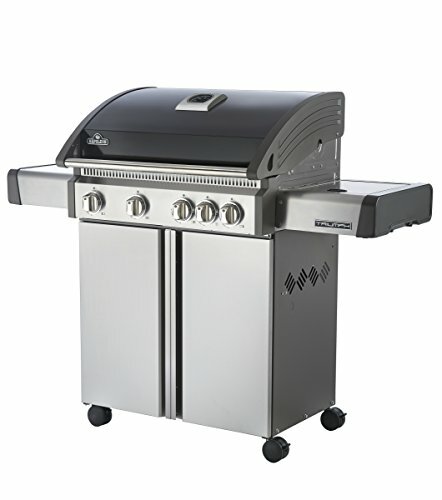 It has a 5-year warranty for the stainless steel burners, porcelainized cast iron grill grates, and the sear plates. All other parts have a 2-year warranty against manufacturer defects. The Napoleon T495SBNK Triumph does a very good job of marrying visual appeal, with quality, and functionality, all with the energy efficiency you can only get from natural gas. Being able to integrate an accessory rotisserie is also very nice. Just remember to keep it clean, and take it easy when you clean the stainless steel burners.